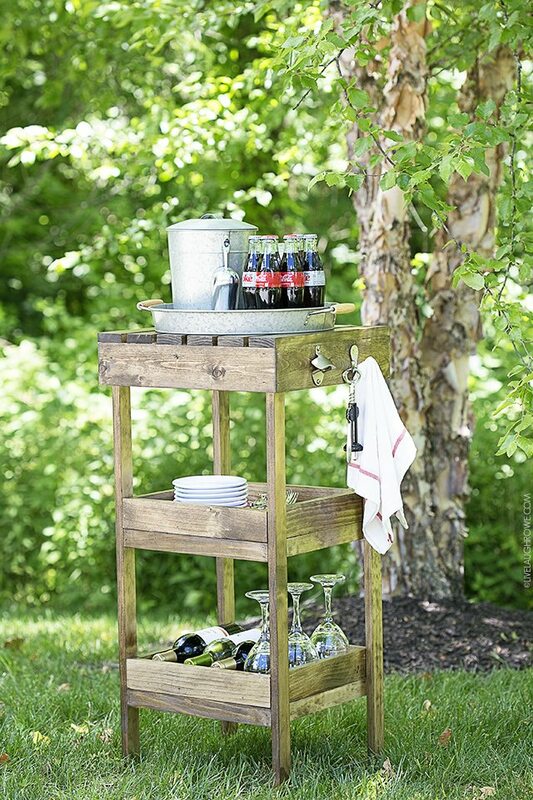 DIY Drink Station, a great piece for your next BBQ or Cookout! I’m super excited to share my version of the June 2016 DIH Workshop project today! 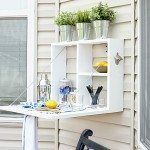 This DIY Drink Station far exceeded my ideas and I couldn’t be happier as to how it turned out. 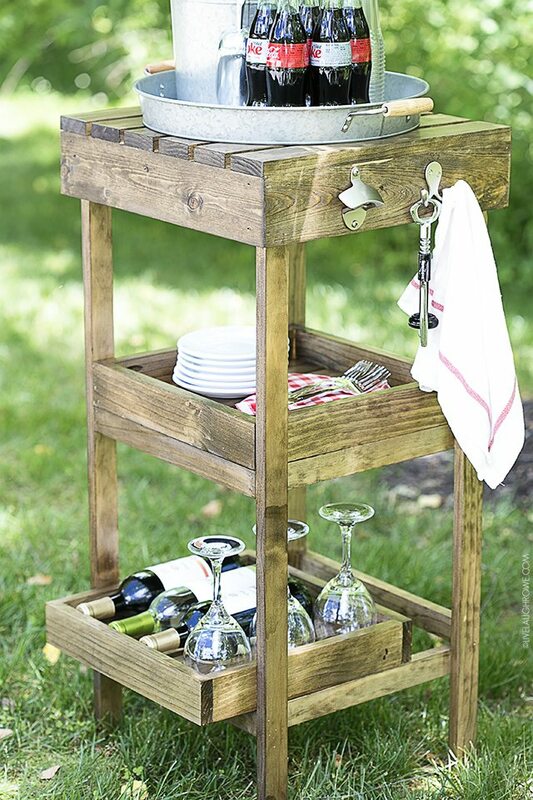 If you like to entertain (whether indoor or outdoor), a piece like this is essential! Be sure to read the entire post, because there is a feature of this drink station that is my absolute FAVE. No cheating by scrolling to the end of the post — hee hee! Mmmmkay? Before we get to that, let’s take a look at how you can build one of these beauties for yourself! 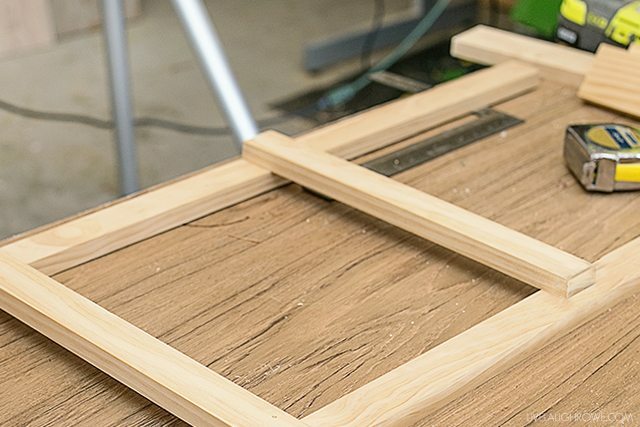 Using the two 1 x 2 x 6, cut four 36” length pieces for the legs. -Two 14 ½” pieces for the back leg braces and shelf stop. 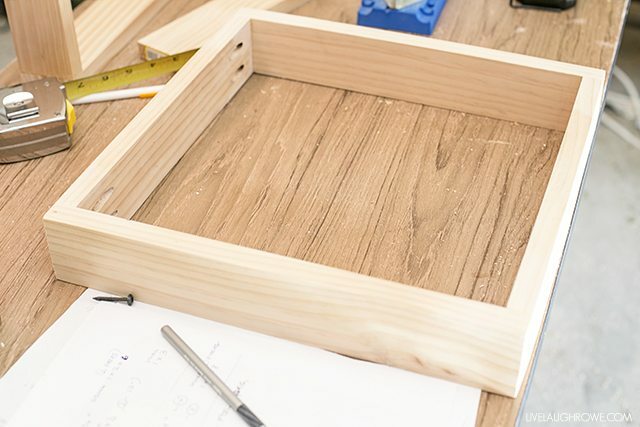 Assemble the legs by laying two 36” pieces of wood (2” side down) parallel with each other 15 1/4 “ apart from the outer edge and attach the 14 ½” side brace where the top of the brace comes 7 ½ “ from the bottom of the leg. Attach flush on one side and come in ¾” on the other. Continue to attach the second side brace where the top of the brace comes 20 ¾” from the bottom. Attach flush on same side as first brace and come in ¾” on the other. Repeat for the other pair of legs. Stand (or lay) the two leg portions parallel to each other and attach a 14 ½” back brace to the inside of the legs resting on top of the side brace that is flush to the legs. Repeat for the other brace. 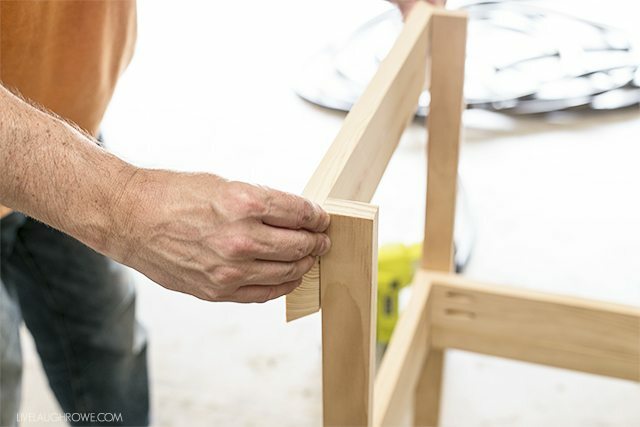 Attach a 14 ½” brace on the front where the side brace is ¾” in. This brace will be flush to the front of the stand. 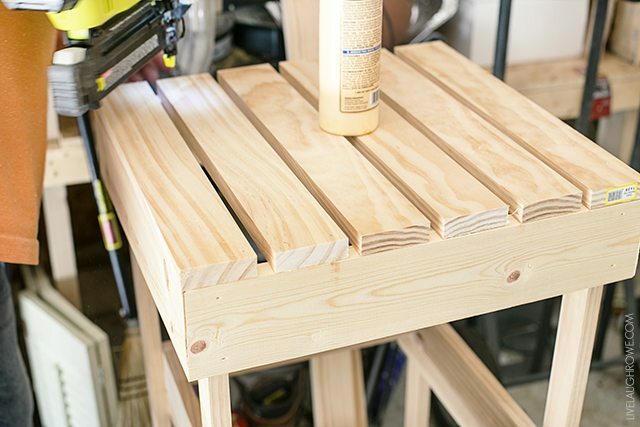 Use clamps to allow wood glue to dry for extra support. Attach the two 14 ½” with the two 13” pieces to make a 14 ½” x 14 ½” square. Repeat to make the second box. 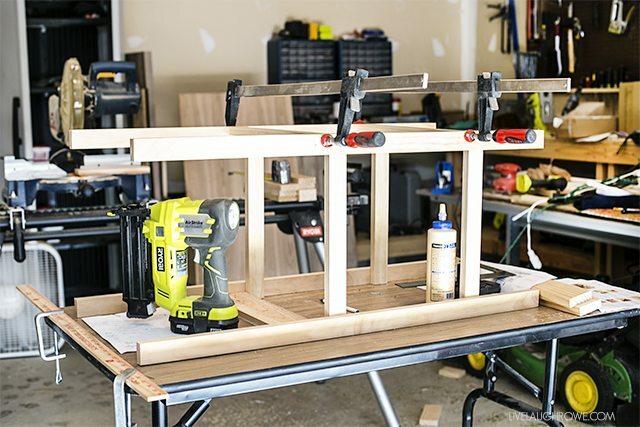 Attach the four 13” slats to the bottom to using a Kreg joint to complete the shelf box. Repeat for the second shelf box. 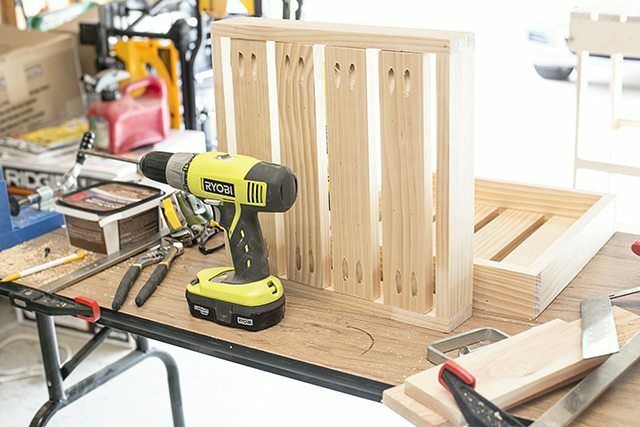 Build the top box by cutting four 16 ¾” mitered corner pieces from the 1 x 4 board. You can either build the box and attach it to the legs or attach one piece at a time working around the legs. Cut six 16 ¾“ pieces of 1 x 3 to form the top shelf. Space evenly apart. 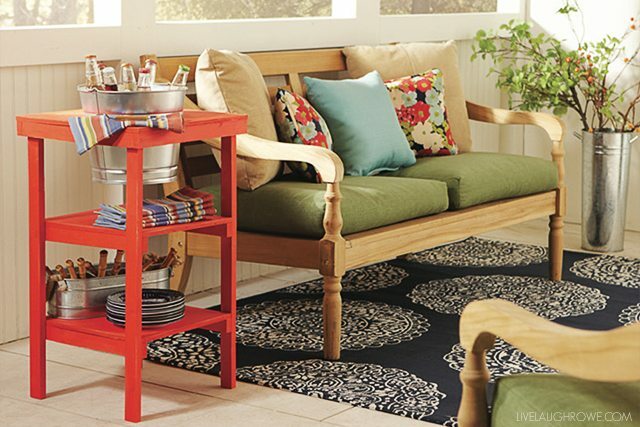 Once you’re done — you can paint or stain the drink station! I chose to stain mine using Minwax Real Walnut and used Minwax Indoor/Outdoor Helsman Spar Urethane to seal it. 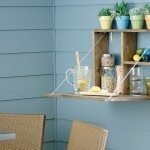 The other option to save you some time is to use a deck stain. I added a hook and bottle opener to the side of mine as well. Both seemed essential. Where there are drinks, there will be messes, right? So having a towel handy seemed necessary (wink). I think it turned out fabulous! Want to know one of my favorite features? If you scroll down a couple of pictures, you’ll notice that the shelves are REMOVABLE! 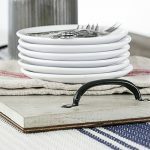 They can be removed and used as serving trays too. Eeeeek! Isn’t that awesome sauce?!? How cute is my little helper? Leo (and his mom) were both a HUGE help for this photo shoot! Below you can see the shelf is pulled out. Isn’t that a great feature? 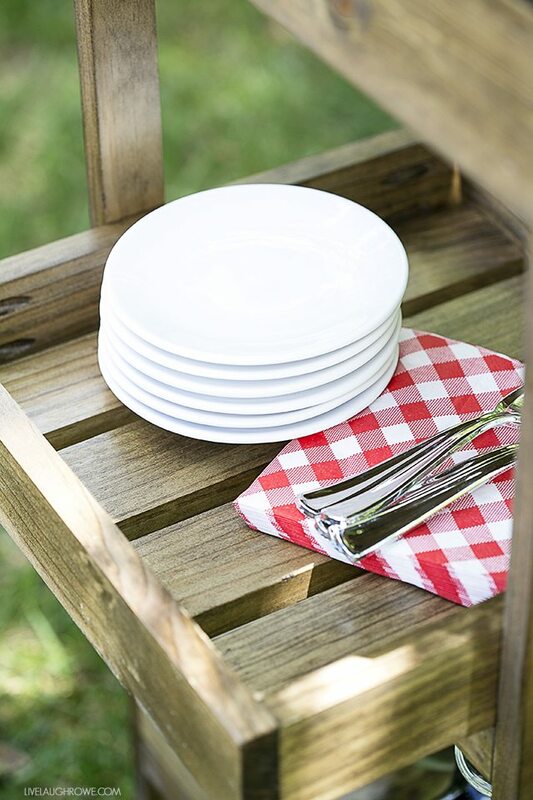 Place a few appetizers on one and use it to serve your guests. That’s it! I hope you’re feeling inspired to build your own DIY Drink Station. Be sure to Save the Date for this Thursday, June 16th at 6:30 p.m. Sign up to join your local Home Depot! I love this!! And I love that you can slide out the shelves!! So brilliant! Thanks Jen. 🙂 Appreciate it. Yeah, the removable shelves are pretty great…makes it that much more functional. Have a GREAT Monday! xo. Love the rustic look you gave yours!!! Thanks so much Nancy! 🙂 Happy Monday! HUGS! 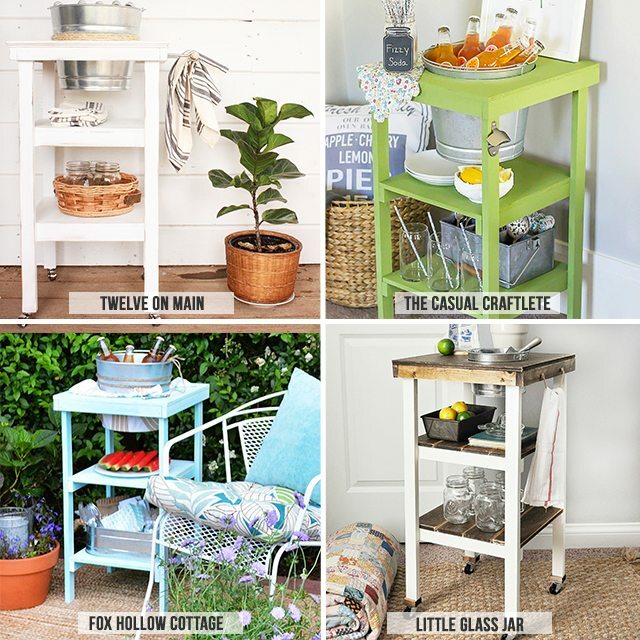 Totally crushing on the slat crates you added!! Thanks Heather. I appreciate it. I love that they can be removed. 🙂 Have a great day. xo. I love how yours turned out, and I can’t wait to see the rest of them! Seriously, your cart is just awesome! I love the stained wood look too, of course! XO! Thanks Ashley! I appreciate it. Yours looks great too!! So, glad you get to be apart of the fun DIY projects this year. 🙂 HUGS FRIEND. I absolutely love this Kelly! You’ve inspired me to do my first workshop! Thank you soooo much, Lydia! I’m super excited to hear you’ll be attending your first workshop too. HUGS!! Absolutely love this and the best part is I got to see it close and upfront?! When do you start taking orders?. LOL. Thanks Mom! I’ll see what I can do. 🙂 xo. 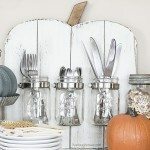 I love the addition of the opener and hook, as well as the pull out shelf! 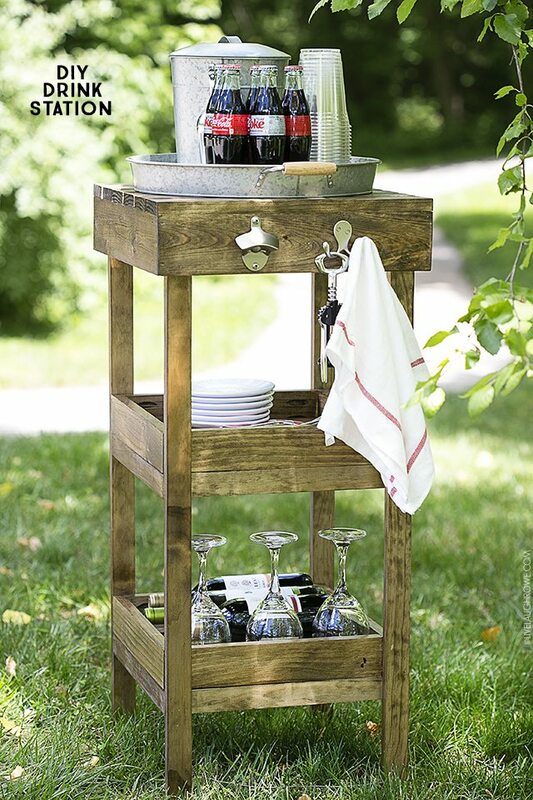 I am headed to my Home Depot tonight to make one of these for myself! What a fun project!! Perfect for summer entertaining. So much better than the tacky cooler we usually drag out! I love functional, simple pieces like this. Great tutorial for anybody to make! This is so darling, Kelly! 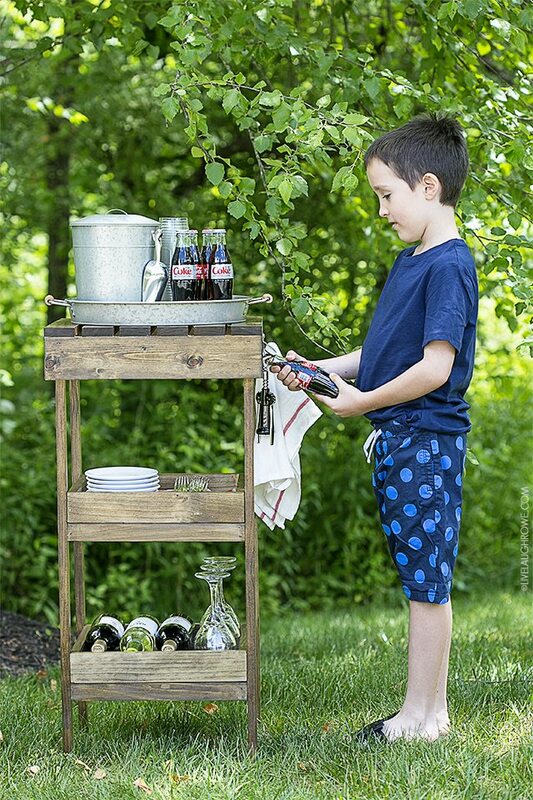 What a wonderful idea for summer! Thanks so much Lana! Appreciate it. I’m sure your husband will enjoy building it and you will enjoy having it around. HUGS! Thanks so much Lou! Appreciate you stopping by. …and Welcome! It’s always nice to have new readers. 🙂 Have a wonderful evening. HUGS.